The first major update to both Weaponiser Basic and Fully Loaded sees a whole host of new features and presets to further improve your workflow and maximise your creativity. We’ve made it easier than ever to create dynamic, responsive sound design in Weaponiser. You can currently add speed and amplitude variation to any bank in any of the plugin’s four engines, but also load up to five samples into each bank. That’s up to 80 different assets to be chosen on every trigger, with variation on 32 parameters! In V1.1.0, we’ve taken this to the next level by adding variation controls on all of Weaponiser’s synths. That’s another 22 parameters that can shift subtly or wildly on every trigger and round, even in Burst Mode. Burst Mode now also has its own variation control, offering everything from subtle shifts, breaking weapons to drastically shifting fire rates, all programmable via one control. Weaponiser’s mixer now includes panning per engine, and an all-new expanded Multi-Mode EQ (with a range of filter types now supported on all bands) for each engine FX slot. This makes the mixing process and having tighter control over your sounds even easier than before. Stereo waveforms are also supported in all banks and engines. 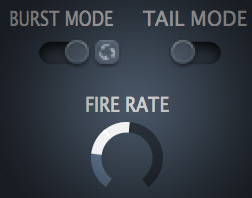 After many user requests, we’ve now created a dedicated ‘Tail On Release’ system, allowing a tail to be triggered on the release of the fire button or midi note, making it easier to achieve a cleaner mix or extra control over tails when in Burst Mode. We have also integrated this using ‘Tail Mode’. Simply use the ‘Tail Mode’ switch to activate or deactivate this new mode. Again, Weaponiser’s new features open up a whole host of creative possibilities. For example, try using ‘Tail Mode’ to automatically set up a reload sound in the tail engine, which will be triggered every time a burst finishes. Handling of the Tail modules’ impulse response reverb has also been improved. You can now trigger a tail on the release of the fire button or midi note, allowing a cleaner mix or extra control when in Burst Mode. This allows for precise control of spatialisation, as well as some interesting creative possibilities! We are excited to present our NEW Battle Bundle, designed in partnership with Red Libraries and Stephan Schutze (Jurassic Park: Operation Genesis, Starship Troopers: Terran Ascendency and The Polar Express) for use with both Weaponiser Basic and Weaponiser Fully Loaded. Featuring a staggering 5854 high-quality combat sounds – from sword attacks and rapiers to chainmail, shields, metal, hand-to-hand combat, body falls and impacts plus much more, the Battle Bundle is one of the most comprehensive libraries of battle-related sounds ever recorded for TV, film and video games.